Spring is here and so is the time for Spring Cleaning! When you think of spring cleaning, most think cleaning the windows, floors, vaccuuming, and other household chores that may have been slacked on during the winter! However, don't forget to get organized as part of your spring cleaning routine! 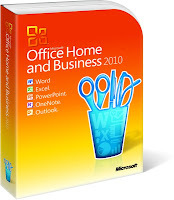 Office Home and Business 2010 is a wonderful tool and helps keep the entire family organized. As winter begins to fade and our days become longer and warmer, it is a great time of year to start a new project or hobby. For example, do you dream of starting your own beautiful garden, but are overwhelmed about where to start? Microsoft OneNote has templates to easily organize your ideas, budget, and time. Word 2010 - Transform your ideas into professional-looking documents. Excel 2010 - Achieve valuable insights with powerful analysis tools. PowerPoint 2010 - Turn your ideas into impactful presentations. OneNote 2010 - Collect your information in one easy-to-find place. Outlook 2010 - Stay connected to your world with our most up-to-date e-mail and calendar tools. I love Microsoft Office Home and Business 2010 because it includes everything I need to get organized this spring! Whether I want to get organized with my blog/business, home life/finances, or with my gardening, Office Home and Business 2010 has it all! I really like to use Excel, OneNote, and Word! Excel 2010 is perfect for organizing the personal finances in our house! I can create a budget or track personal expenses easily with ready-to-use templates in Excel 2010. Once you have all your info and ideas, you can organize all your information in a single place with OneNote 2010. Just easily create a OneNote notebook to organize all the materials and media for a project: text, images, videos, audio, web page clippings, and more. And of course, Word 2010 comes through for me for creating documents quickly with ready-to-use templates for almost any project, from business reports to family newsletters. And for more excitement, you can add visual interest to your text with effects such as shadows, reflections, and 3-D.
Microsoft Office Home & Business 2010 has it all for getting organized this Spring! No matter what your interests, hobbies or business is, Home & Business 2010 will keep you organized and clean this Spring! Buy It: You can purchase Microsoft Office Home and Business starting at $199.99 on the Microsoft Office website. Win It: Microsoft Office is generously offering (1) boxed copy of Office Home & Business OR Office for Mac to a lucky winner!